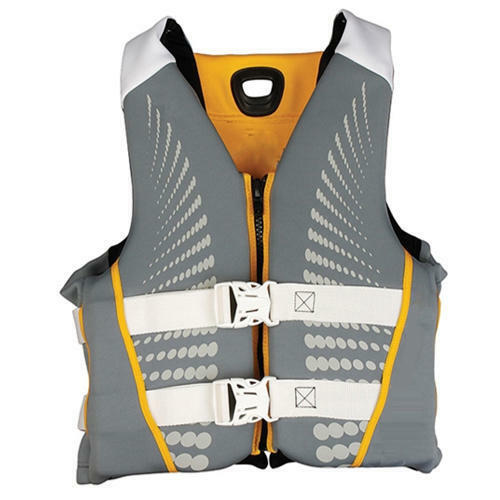 We are offering Sports Life Jacket to our clients. We Marine Marketing Services, is serving our customers by manufacturing, trading and wholesaling a high-quality Life Jackets, Lifebuoy Light, Gas Detector, Fire Hose, Sealing Tapes, Intime Fire, Fall Prevention Device, Hydraulic Release Unit, Tier Light, Salvage Drum, etc. Offered products range consists of Ultra Safe Products, Fire Fighting Equipments, and Marine Safety Equipment. We use latest technology, and machines while manufacturing these products. The product range is highly required for their dimensional accuracy, high strength, corrosion and damage resistance and longer life. In addition to this, our offered products are widely demanded in various fields. Our professionals selected through industry approved selection procedures. This team's persistent endeavor and hard work are the reason behind our company development. They with their rich industrial knowledge and years of experience in the concerned field have assisted us to establish a distinct position in the industry. We are able to deliver all the products on time at client’s destination, as we have developed a wide distribution network. We are a quality-driven enterprise dedicated to offering products to our valued clients. Moreover, we have developed a huge client base across the market.